Each country facing a lionfish invasion has “its own unique set of problems”, according to Graham Maddocks, president and founder of The Ocean Support Foundation (OSF). Mr Maddocks said the problem in fishing for lionfish is the depths in which they are found. Research is ongoing into the local situation but “200ft seems to be the sweet spot”, he said. “It’s not like in the Caribbean where they are found on the shallow reefs. We have them in the deeper waters here,” said Mr Maddocks. “The Bahamas has thousands of miles of shallow reefs, which is a great habitat for them. And then there are islands like us, which are remote and steep. The upwellings — cooler, nutrient-rich waters — attract juvenile fish species, which in turn attract lionfish. “The ‘hotspots’ seem to be reefs on the seamounts, rather than flat barren landscapes; areas where bits of cliff have fallen or broken away, and which have coral nodules. “They are getting up into shallower depths, but not in great numbers. “However, we are seeing them now on recreational dive sites. We are finding them between 200ft all the way to 10ft in Castle Harbour.” Mr Maddocks said: “Restaurants in Bermuda would take every single lionfish you could give them, but it’s getting the fishermen to target them. “It’s easy to say, ‘Let’s go out and kill them’, but fishermen have a hard time targeting them with traditional methods. 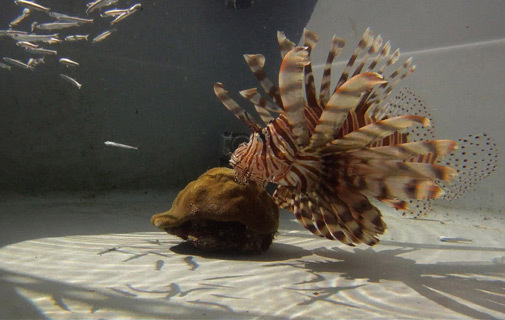 “Lionfish don’t hook and line well because they like live food, not bait. In partnership with Government, the OSF has licensed more than 280 recreational divers to spear lionfish anywhere on the Bermuda platform, using a three-pronged paralyzer tip. However, they are not allowed to sell their catch on — unless commercial fishermen by trade. The Reef Environmental Education Foundation has produced The Lionfish Cookbook (Tricia Ferguson and Lad Atkins), available at bookstores and dive shops. Mr Maddocks can foresee the invasive species being served up as a delicacy in Bermuda’s restaurants. “Lionfish could be served as sushi,” he said. “It’s high in Omega-3 (fatty acids) and low in mercury, and so it’s healthier. You get smaller filets, but it’s less expensive than imported tuna. Ready to spear your lionfish yet?